The unfinished tragedy “Die Maltheser” by Friedrich Schiller – A contemporary dance and music theater event under the artistic direction of Irina Pauls and with the participation of the world-renowned vocal ensemble Amarcord Leipzig. Five dancers and the vocal ensemble amarcord with their baroque a cappella singing join the live electronic music and new compositions by Matthias Engelke. The spectator finds his way into the atmosphere of the Ottoman expansion in the Mediterranean in the 16th century, experiencing the issue of resilience of a European congregation via sound and dance. 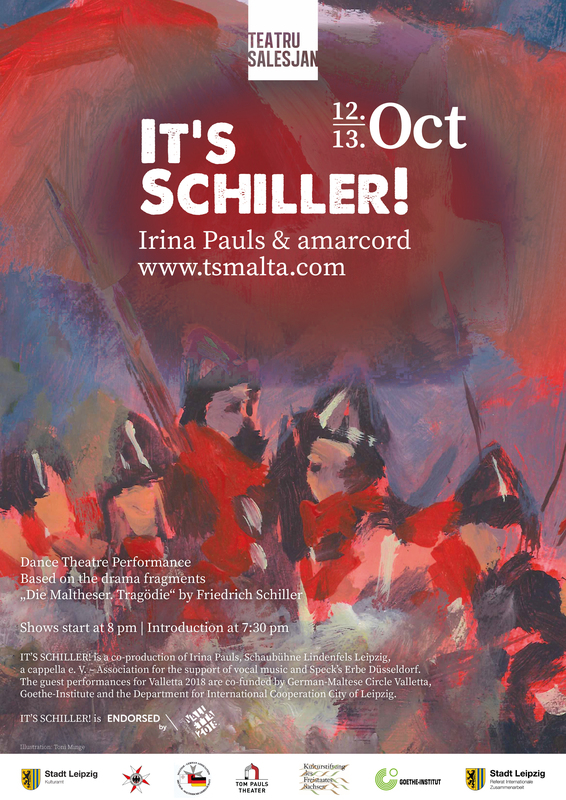 The production, which is endorsed by the Valletta 2018 Foundation, is a cooperation project of the German-Maltese Circle and the Goethe Institute together with the Leipziger Choreographer Irina Pauls and the Carl Orff Institute of the University Mozarteum Salzburg (Department of Music Education). Another partner is the Association for the Promotion of Vocal music – a cappella e. V., whose founding ensemble Amarcord celebrated its 25th anniversary in 2017. Performance dates: 12 & 13 October 2018. Shows start at 8.00p.m. Introduction at 7.30p.m. before the shows. Official Poster: Click here !